Staying in the finest accommodations, dining on exquisitely prepared dishes by top chefs and sampling wines from award-winning vineyards the world over — that is the life of a travel editor. But there is another side to our savvy Hideaway Report explorers, one that appreciates the challenges and thrills that can be served up only by the great outdoors. Each year our editors name their best travel experiences from the previous 12 months. But having the perspective of a lifetime of travel is invaluable. We asked our editor-in-chief which outdoor adventures have been his favorites, from idyllic hikes to the perfect place to brave the rapids. So is it safe to say that you’re not someone who simply wants to lie by the pool all day while vacationing? I like sitting by the pool as much as most other people, but I find that after a while idleness allows worries to return. Activity dispels them. How does participating in outdoor activities cultivate additional opportunities in which to embrace the local culture and environment? I find chatting with the fishing guide or dive instructor very fascinating. In far-flung lands, peoples’ lives are both completely different and surprisingly the same as our own. It’s always interesting to reimagine one’s own life: What would it have been like if I’d been born in a village on the edge of the Kalahari? Do you find that in a society overrun by tablets, smartphones and other high-tech gadgets that people are losing their appreciation for the great outdoors? No. I find that my children respond to nature just as much as I did when I was their age. But because of the web, they know a lot more about it than I ever did. Hiking made your list of favorite outdoor activities. Why? It often takes you to beautiful places and the exercise gives you a high. The endorphins kick in. Where are some of your favorite areas in which to hike? England’s Lake District is interesting because of the cultural associations: Wordsworth, Coleridge, Turner, Ruskin. 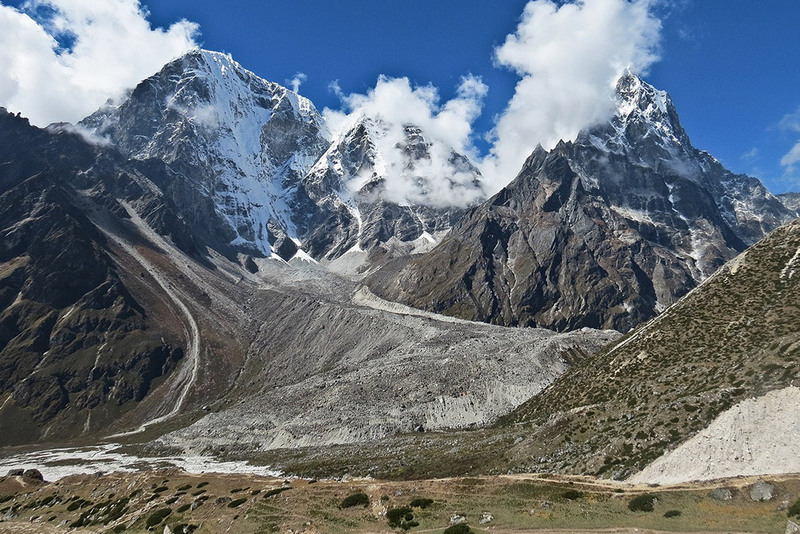 But there is nowhere like Nepal, especially if you get away from the crowds trekking up to Everest Base Camp, or around Annapurna. The scale and grandeur of the scenery is incomparable. It’s the most beautiful place on earth! That’s pretty mountainous trekking. Does the altitude and rocky landscape add to the appeal? Yes, for me, mountains make it different. There’s a reason that the Indians imagine their gods living on mountaintops. Mountains seem to be a connection between earth and a spiritual reality. Some climbers say, “Oh, they’re just chunks of rock with snow on them.” I find that vaguely sacrilegious. Can you share a particularly memorable time on a hike when you couldn’t help but stop and revel in the moment? I remember waking up one morning in Nepal. It was cloudless after a storm, and you could see for 200 miles. Suddenly, the highest mountain, in this case Annapurna, caught the first rays of the sun. The rising sun then lit up the peaks in descending order. Your preference seems to be toward more rugged, pastoral hikes. Can hikes in urban areas be equally rewarding? I actually love wandering around cities. My favorites are Rome, Paris and London. Walking is the best way to learn about a city. And if you walk, what you learn, you never forget. How does fly-fishing compare to heading out to sea and reeling in a 200-pound marlin? It’s the action of casting itself that makes fly-fishing so interesting. And catching a five-pound bonefish on a light fly rod is much more exciting than hauling in a marlin. Besides which, marlin are endangered these days and should be left alone in my view. Sight-fishing, casting to a specific bonefish or trout, is the kind of fishing that I prefer. Bonefish are supposedly really fast. Yes, they’re the Ferraris of the fish world. Can you tell us some of the best places for angling for some of the most popular kinds of fish? Atlantic salmon: northwest Russia. Steelhead: British Columbia. Trout: New Zealand, Argentina, Chile, Alaska and the American West. Bonefish: the Seychelles. Tarpon: probably Cuba. 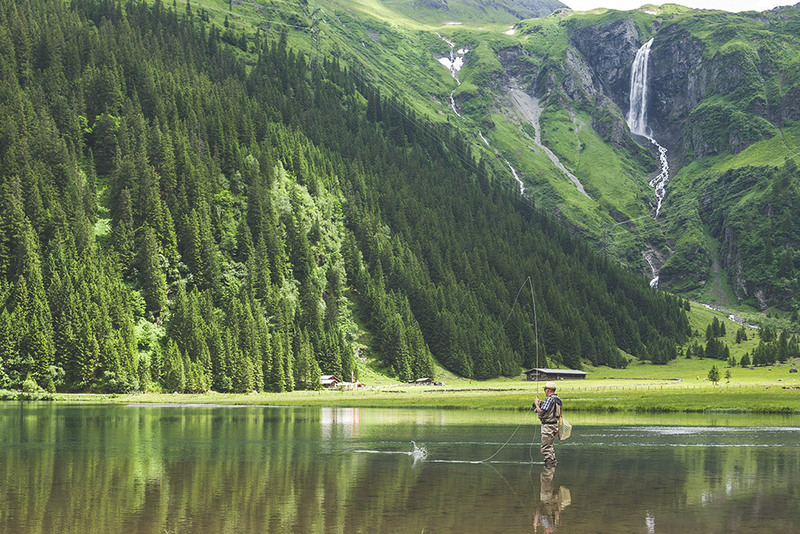 Do you have to be a skilled fisherman to enjoy bone- or fly-fishing? Not for all kinds of fly-fishing. But you have to be skillful to catch bonefish, because you have to cast a long way and very accurately to succeed. What’s been your greatest or most thrilling catch? I caught a 19-pound fresh-run sea trout in a fast-flowing river in Tierra del Fuego. It was like being attached to a submarine. 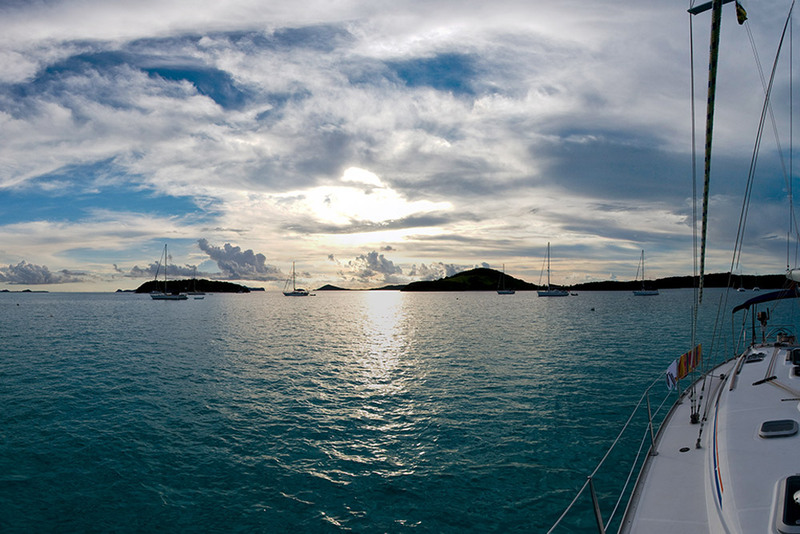 Tell us about an unforgettable sailing experience you’ve had. I’ve sailed on many different kinds of boats, but there is little in life more pleasant than putting up the sails of a 48-foot yacht in St. Vincent and letting the trade winds blow you down the Grenadine Islands to Grenada. And sailing on Sydney Harbour on a sunny day is simply magical. It has frequently made me think of moving there. Do you like sailing excursions where you actually get to help sail the boat? Absolutely. I like to sail the boat, which means I crank a few winches and haul on a few ropes! However, if you want something more luxurious, you charter a big yacht and have a crew sail it for you. Diving is something you also love to do. 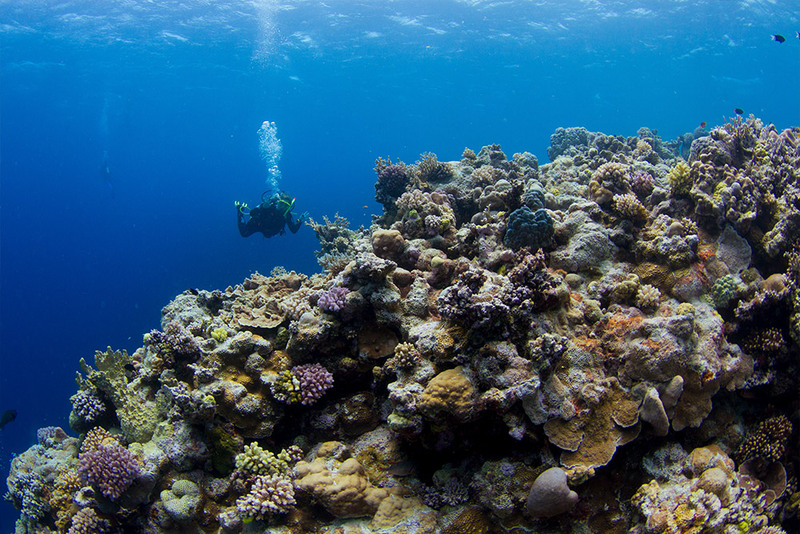 Describe for us what it’s like to dive in a revered destination like Australia’s Great Barrier Reef. If you dive from Lizard Island right out on the Barrier Reef, there are huge numbers of big fish, spinner dolphins and sharks, but you can also feel the Pacific swell just beyond the coral — the immensity of the world’s biggest ocean. What about Belize? Where did you dive there? All along the barrier reef. But I’ve not done the famous Blue Hole. You see nurse sharks, tarpon, barracuda, turtles and a zillion small, brightly colored fish, so thick in the water sometimes you can’t see where you’re going. What was special about the diving off Moyo Island? The clarity of the water in Indonesia is the best I’ve encountered. It’s astounding. The water is almost not there. Of course, diving isn’t always just about tropical fish and colorful coral. You’ve had a chance to dive World War II wreckage sites. What was that like? I sat in the driver’s seat of a World War II Jeep on the deck of a sunken ship 120 feet down, put my flippers on the pedals and tried to turn the steering wheel. It was off Moyo. What’s the strangest or most exotic thing you’ve encountered when diving? Whitewater rafting is another one of your favorite activities. Is the adrenaline factor, maybe even the element of danger, part of why you enjoy it so much? Actually, my favorite trip was quite gentle. 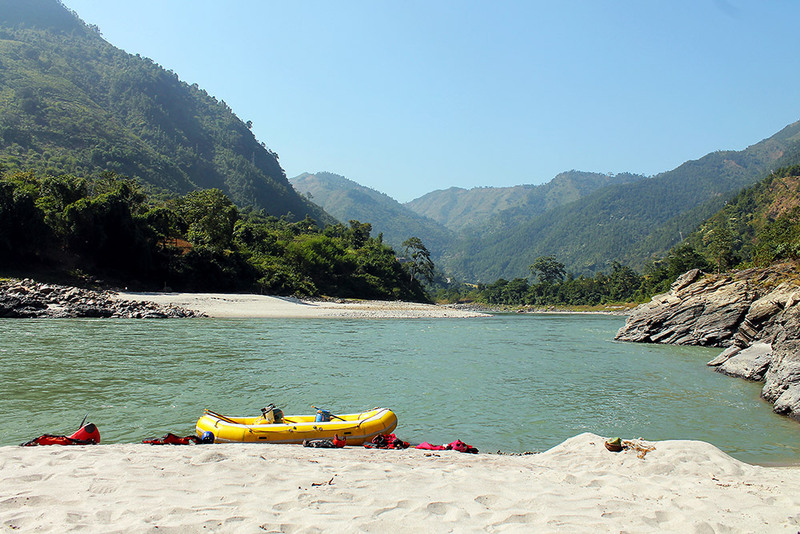 We rafted down from beneath Dhaulagiri in Nepal to the Karnali River, through pristine forest inhabited by tigers. There were only three or four rapids on which you might get flipped. The rest of the time you drift gently along, admiring the scenery and the birds. I also canoed down the Zambezi, which was wonderful, very tranquil, with astonishing birdlife, elephants. But then you run into a pod of hippos and it suddenly gets dangerous. Tell us about your experience rafting at Victoria Falls. I found it fairly alarming. Some of the holes you fall into are enormous. But it depends on the time of year. When the river is full, then the volume of water smooths out the rapids. It’s when the river is low that it becomes seriously scary. You drop into great chasms and it’s impossible not to get flipped. I must say, I don’t really like the idea of being in a Class V rapid with the raft on top of me. I’ve had this experience, and I don’t need it again. Where’s a place to raft that might be more appropriate for the whole family? In Belize. You raft on the Macal River down from Chaa Creek Lodge to the town of San Ignacio. It’s incredibly peaceful; a wonderful trip for kids. There are lots of tropical birds, and you can get out and swim in the pools. Have you done any longer, multiday rafting trips? The Nepal trip took four days and I camped on sandbanks at night. One night I was sitting by the fire with some Sherpas and a tiger came down to the river to drink about 50 feet away. It just looked at us and then turned around and walked slowly off into the forest. You could hear its feet crunching the dry leaves for two or three minutes. 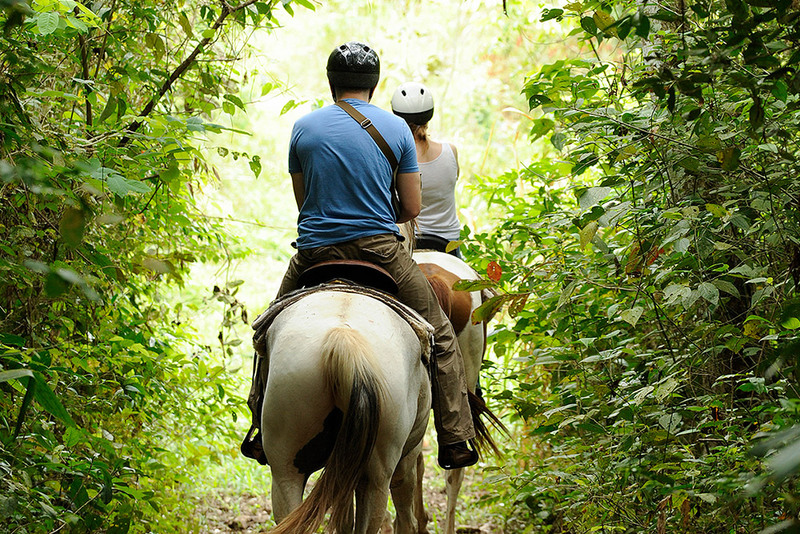 Images of horseback riding are often most associated with the American West, yet you have had the opportunity to ride against many other of the world’s diverse backdrops as well. I enjoy horses as a way of getting around in nature. You are part of it. My favorite riding trip was in the Okavango, surrounded by wild animals. You can actually canter along with a herd of giraffe. Running into a lion pride can be a little exciting, however. The western U.S. seems like a particularly choice riding spot since it’s so reminiscent of the days of horse travel and saloons and other symbols of the Wild West. What’s your favorite place to ride there? I loved riding from Smith Fork Ranch in Colorado, going up to 14,000 feet in the San Juan range. Argentina is equally well-known for its cowboy (gaucho) culture. Yes, Argentina is great riding country. I did a gaucho trip there once, sleeping on a sheepskin in the open air, wrapped up in a poncho, and drinking mate tea from a gourd. The Argentines are the world’s greatest horse people. Go to the Argentine Open Polo Championship if you don’t believe me. But they’re a bit too tough on the animals for my taste. I’m squeamish when it comes to horses. Youngsters love horseback riding, too, which makes it something pretty much everyone can do. Definitely. Even young kids love riding from Chaa Creek in Belize. It’s through the forest and you try to sneak up on the howler monkeys. The toucans are always a thrill.